What Historical Person Would You Like to Share a Dram With? As published in the Bourbon Zeppelin Newsletter . Since I was a young boy I have been fascinated with the old west characters. Heroes who tamed the cow towns and brought justice to a new big land. People like Wyatt Earp, Wild Bill Hickock just to name a couple. But If I had one chance to sit down and have a drink and a cigar with someone, I would like to have done that with John Wayne. John Wayne has always been at the top of the list not just because of his iconic movie roles, but that he had stated that his portrayals of lawmen in his movies came in part from meeting and talking with Wyatt Earp when he was a young man working as a prop boy in early movies. I would have to say at first, I know I would be awestruck and mention how much I loved his movies and the no-nonsense way he took care of business. Above all, I would like to sit and talk about just being a cowboy. In my mind, no one ever paid homage to the Wild West like he did. 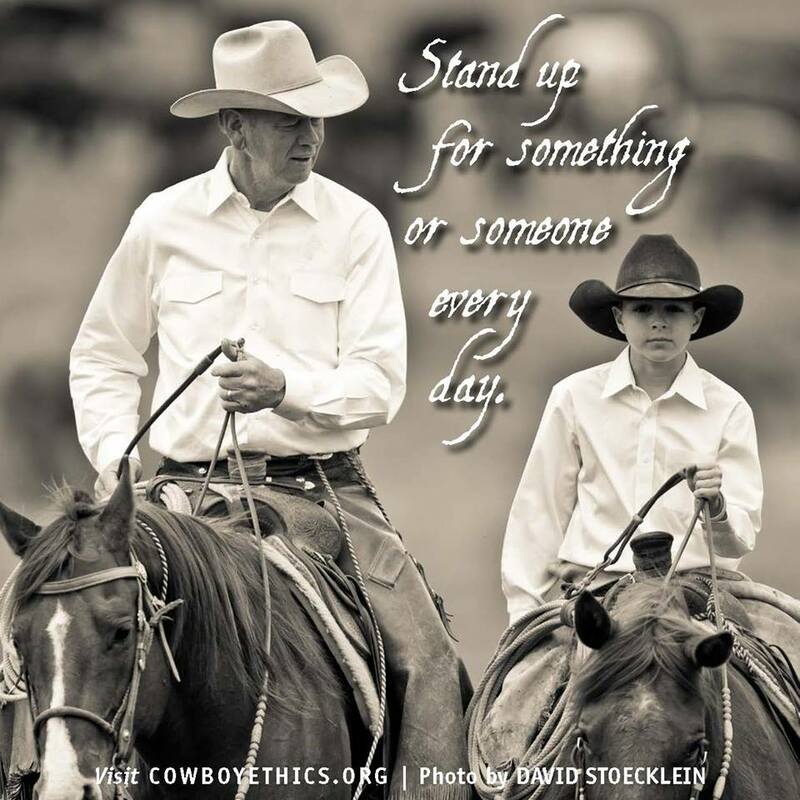 I would tell him how much I appreciated the fact that he had Cowboy Ethics, and lived by that code, even in life. In the movies, he never shot a man in the back and was very adamant about that. He treated people with respect until he was disrespected and that stayed with me my whole life. John Wayne was a man above men, back when handshakes meant something and you didn’t talk unless you had something worth saying. We could use a few more like John Wayne these days. So, I will make this short and sweet. 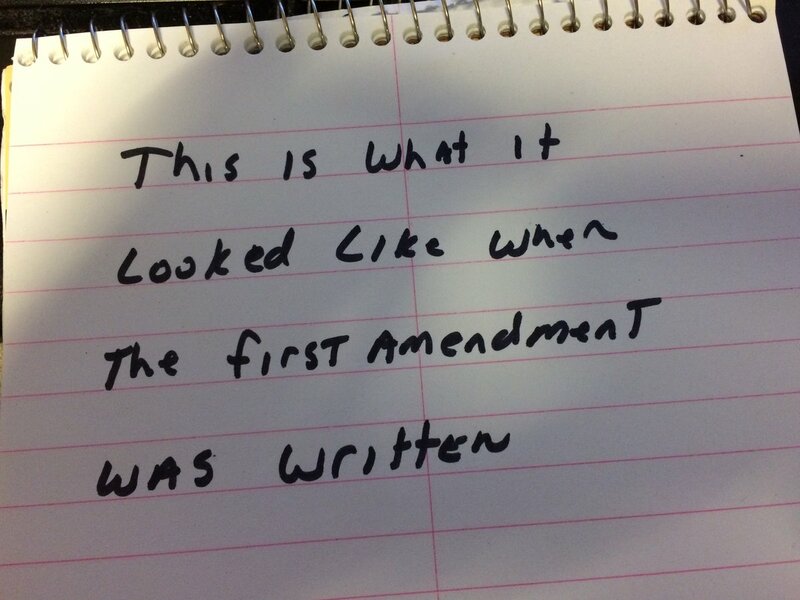 If the 2nd Amendment meant only muskets, I guess we have to give up computers, landlines, cell phones, TV and Radio because the 1st Amendment meant Voices, Pen and Paper! The Second Amendment has been around a long time, it was put into the Constitution to allow all Americans the right to keep and bear arms so that if the U.S. government became tyrannical, that the people could rise up against the government and take the country back. Many arguments are made that the Second Amendment was designed for weapons of that time and does not grow with technology. That argument just does not hold water. Our Constitution is a document that is like no other, it grants us the rights to live free and stay free despite what some who do not agree nor follow it to the letter believes. You have people from other countries telling us how we should interpret our own constitution and how we should ban, what they consider, “assault” weapons. These same people have no clue what an “assault” weapon is, as a matter of fact, they have no clue the difference in the terminology they use, nor how firearms actually work! Any weapon can be called an “assault” weapon if used in an assault, however, the proper use of “assault” weapon is being misused when the anti-gun groups refer to AR-15s as “assault” weapons. The AR-15 is nothing more than a dressed up semi-automatic rifle. It can only shoot one time per trigger pull. But because it “LOOKS” like a military style rifle, they consider it an “assault” weapon! The AR-15 shoots no different than the common deer rifle, you can use the same sights to aim with, you can put different grips on it, and use many different magazine sizes. But it still only shoots one time per trigger pull. A true “assault” rifle would be considered a fully automatic weapon, or a weapon with a select fire (can select between semi-auto, three round burst or fully automatic). Now that you know the difference, we can move on. 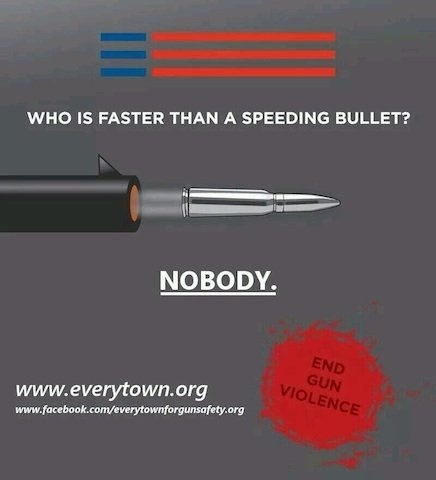 First, here is a info-graphic from Michael Bloomberg’s anti-gun group who do not know the difference between a rifle shell and a bullet when it is fired. They thought (and I use the term “thought” loosely) that the entire shell is propelled out of the rifle barrel. This kind of ignorance is dangerous, and completely inexcusable for a group who says they know what they are talking about! Of course, it only gets worse when you have a United States Congresswoman who was a sponsor of a bill to ban high capacity magazines. She states that if you ban the magazines from being produced, that once all of the magazines in existence are emptied, that they will not be able to use them again. What is truly amazing is that the ignorance of this woman stating this was elected! Here the actual clip of her making the argument in all her glory! Now that we have the common sense of the anti-gun folks out there, lets move on to our own common sense! We as patriots, defenders of our Constitution, we have to bring our level of common sense above all others. We have to be able to make our argument, stick to it and not resort to the tactics of those who oppose us. So far, 99.9% of us are doing a great job at that. We can sit down and discuss the issue and make our case in a rational manner all the while watching the anti-gun crowd throw out misinformation, downright lies and of course as their last line of defense start cursing and calling us names. There are a few who think it is ok to grab their AR-15s and try to make our standing on the issue a spectacle! One thing that we as defenders of the Second Amendment should do, is respect those who we are trying to convince that we are right. I am not talking about the respecting the anti-gun groups because they have their minds made up and they will not change their minds until they are in a situation where they are alone, attacked and have no way to defend themselves. Unfortunately, at that time, it may be too late for them! Every time I go to town, when I am not working, I am carrying my handgun. During the times when the weather is cooler, it is much easier to conceal my weapon (yes, I have a conceal carry permit), but during the hot summer days it is harder to conceal because of the heat. I will either open carry or wear a light jacket. One time I was shopping in Wal-Mart and had a jacket on a person noticed I was carrying when I reached up to get something, my jacket lifted enough to see my handgun and they commented to the person who was with them, “Look at that, I hate that they can do that in public.” They didn’t realize I heard them and I kept shopping like nothing happened. But to walk around with a rifle strap across your back is a bit different, although legal, it sends the wrong message. It is not like having a rifle in a rack in your truck. a scabbard on your horse or even a six-shooter strap to your leg. Carrying the rifle in shopping is a misunderstanding by others waiting to happen and the only reason you would do that in the first place is to draw attention to yourself and ask to be confronted. Are you within your rights? Yes! Is it smart to do that? No! What it actually does is make people feel more uneasy and does not change the minds of those sitting on the fence on the subject. So lets say that people get used to seeing you carry your AR-15 into a store, you do it three or four times a week, even have your buddy come in with you carrying as well. The store knows you, trusts you, and in turn anyone who comes in with you. But one day someone comes in that is not there to be friendly and people ignore it, thinking that it is someone just like you and people die. Whose fault is that? Of course it is not your fault, it is the individual who pulled the trigger, but in some ways, you made it normal to see someone carrying a rifle in the open and therefore made the store complacent! Now a handgun is different, for legal conceal carry individual, the handgun is smaller than a rifle and less intrusive, which means you will not draw as much attention to you as the full size rifle does. Handgun conceal carry or open carry law abiding citizens will carry so that if the need arises, they are ready to take action knowing that bad things can happen very quickly and they might be the only person there to save lives until the police arrive. Criminals, on the other hand, will almost always conceal it until they begin using it. They won’t wear it in on a holster, more like they will have it in their belt, or in their hoody pocket to pull it out when they think that the place (or person) they are about to assault is at it’s most vulnerable moment. So, what I am asking, what I am saying is, do NOT make it any harder to protect our Second Amendment Rights by making a spectacle out of yourselves. Use common sense when you are carrying. Be respectful where you are. Don’t be an “in your face” activist, that is not what we are about! It is one thing to go down to an organized protest, where the point is to show you are able to carry rifles, but to walk into a place, such as the largest airport in the country and try to make your case is just stupid! I follow the law, the constitution, believe in the Second Amendment and love my guns! I believe every law abiding citizen has the right to keep and bear arms without question. How we use that right, and how we conduct ourselves either strengthens our cause and rights, or in the case of the show-boaters gives ammo to the anti-gun crowd (pun intended)! What Shall We See at the Movies Tonight? How Safe is That Theater? It’s Saturday night, and you want to take your wife, girlfriend, family or friends to the movies and you begin to look through the newspapers (or online) for listings in your area. You find a movie that is interesting and that you want to see and the information tells you the time, the location and how much it costs. But you have one other thing that you would like to know that you won’t find in any of the theater listings and that is if it is a “Gun Free Zone” or not and in the wake of the Colorado theater shooting this is something that you feel you should know. This is where a new smart phone application called the “Gun Free Zone App” comes in handy. You can download the App from ITunes and when you go to a local business you can look to see if it is listed as a place that allows you to carry your weapon with you, or a place that does not. That is not the only reason John Peden, founder of the GunFreeZone App, decided to develop this application. Since early July the App has more than 36,000 user plateau with over 350,000 locations marked thus far. You can input information into the App as a customer or as the owner of a business. When you vote on a store, it’s corresponding dot on the map changes color accordingly. Any dot that is blue means there has not been anyone who has voted on that store yet. Response has been pretty positive, with the exception of those who want gun control and those who think that the App will be used by criminals to target gun free zones. 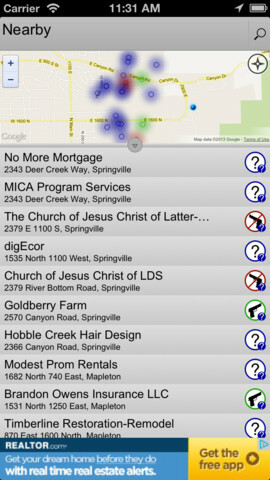 One group in the past month in direct response to the GunFreeZone built an app of their own so that people could pin point households who own guns. 1. Stop shopping in stores that support gun control and get more money spent in firearm friendly stores. Vote with your wallet and remind people that if you don’t want my gun, you don’t get my money. 2. Keep people safe and out of high-crime areas by warning them that criminals may have marked the store they’re in for mass murder. 3. Stop unintentional firearm crime. In some states, a gun free zone sign has the effect of law. If people carry concealed past that sign, it’s usually a felony. Also, if someone has a 20 round magazine in their car in Pennsylvania and crosses the border into New York, that’s a felony. We want to warn them when they’re about to do things like that. Another scenario would be concealed carry permit reciprocity – the phone can know where you are and what states honor your CCW and warn you or help plan your trip so you can stay legal. 4. Stop gun control permanently. This is a future feature but we will be able to layer other data on top of the gun free zone map and educate people on the real life impact of gun control. How does a gun free zone (and gun control by proxy) impact things like crime, graffiti, store closings, rental occupancy rates, property values, divorce rates, inflation, SAT scores, and I have no idea what else. We can put any data we want on our map and find correlations. Then, we can teach people in a personalized way what happens when they see strict gun laws. No bias, no hidden agenda – just what these laws mean for you personally. It’s a very, very effective way to teach people about the law of unintended consequences. The app is free and can be downloaded at iTunes, the Google Play store, or at our website directly at http://www.GunFreeZoneApp.com. By Jeff Nichols, as published in Western Shooting Journal May 2013 issue. WITH THE RECENT TRAGEDIES IN NEWTOWN AND AURORA, and the political fight for the Second Amendment waging in Washington, DC, millions of Americans are heading out to get their concealed weapons permit (CWP). According to the Tennessee Department of Safety and Homeland Security, in Tennessee (the Volunteer State) as of March 2013, there were a total of 398,194 valid Tennessee Handgun Carry Permit Holders. This is an icrease of 13.6 percent since March 2012, when there were 350,327. 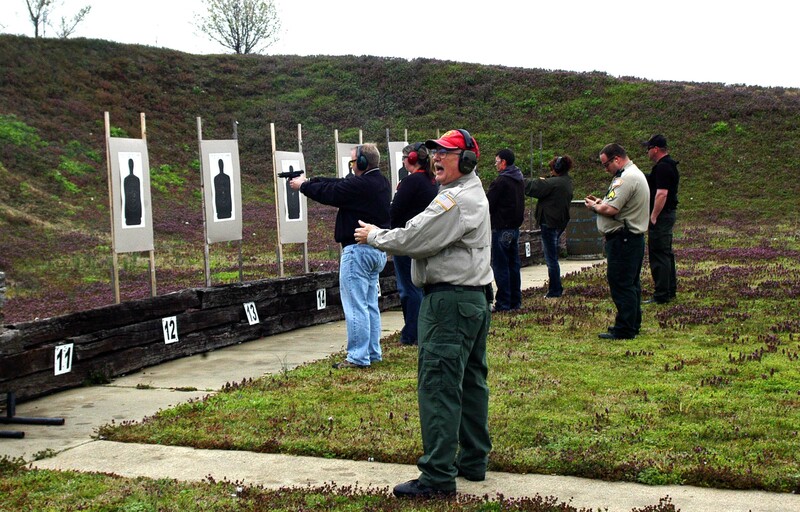 Why do residents of Tennessee want obtain their CWP? I recently attended the CWP class at the Tipton County Sheriff’s Office to talk to applicants as well as to take the class myself. For me, getting my CWP was for several reasons. One reason was to protect myself and those around me. It is not because anyone wants to be a hero, or wants anything to happen. The fact is, having a weapon in case you need it is similar to having a fire extinguisher in case of a fire. It may never happen, but if it does, you will be prepared and may be able to stop another tragedy from occurring. No one ever wants to be in a place where a criminal or a person who is mentally ill decides to kill or maim other people, but the odds of a person being able to commit mass murder when there are honest armed citizens around drops tremendously. MOST POLITICIANS AND CELEBRITIES WOULD LIKE YOU TO BELIEVE that only bad things will happen if citizens are allowed to own guns, while reporting only the stories that represent a person intent on killing as many people as they can. Those same politicians and celebrities would like people to believe that if you restrict or take away certain guns (or all guns), that the criminals will magically begin to follow the law. ** Update: At this time the Tipton County Sheriff’s Office is not conducting handgun permit classes. You can go to http://www.concealedcarryservices.org/tennessee/index.php for information on obtaining your first permit or renewing an existing permit. *Update: After 109 days, I finally received my CWP.